Jammu Festivals and Fairs (Mela) have traditions and age old histrory. Surrounded by the fog of winter when activity becomes subdued, people make bonfire to mark the celebrations of Lohri. Particularly celebrated in North India, Lohri is the festival dedicated to the Gods of Sun and fire. Celebrated every year on the 13th of January, Lohri commemorates the harvest of winter (Rabi) crops. 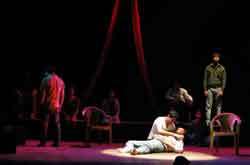 Jammu & adjoining Punjab being the agricultural state observes this festival with enthusiasm and exuberance. With the month of Paush coming to an end and the sun moving north from Makar (Capricorn), Lohri warms the hearts of thousands of people across Jammu and Punjab as well as Himachal Pradesh. 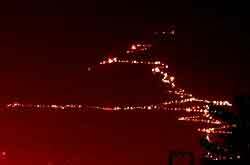 Navratra Festival in Jammu region is famous for its celebration in Katra, the base camp of Shri Mata Vaishno Devi. Though the yatra to the shrine of Mata Vaishno Devi is a round-the-year event, the one undertaken during the Navratras is considered the most auspicious. In order to have all-round success in life, believers seek the blessings of all three aspects of the divine femininity - Goddess Kali, Goddess Lakshmi and Goddess Saraswati. A large number of tourists pay their obeisance to the deity during this period. Shiv Khori Festival is celebrated on the eve of Maha Shivratri every year at the Holy Cave Shrine of Shri Shiv Khori in Ransoo, District Reasi, Jammu. 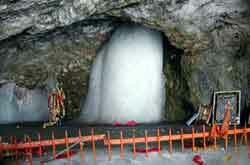 Lakhs of pilgrims from different parts of the country visit this Cave Shrine to seek blessings of Lord Shiva. Dedicated to the Lord Shiva, the Shiv Khori Shrine is situated on a hillock in Jammu region of the Jammu & Kashmir state. Vehicles go up to Ransoo, surrounded by lush green mountains. Pilgrims have to traverse about 3 kms track from Ransoo by foot. 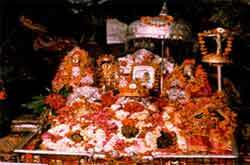 The Shiv Khori Shrine can be approached by road from Katra, Udhampur and Jammu. The Road Distance of Village Ransoo is approximately 130 Kilometers from Jammu and approximately 80 Kilometers from Katra (the base camp of Mata Vaishno Deviji). 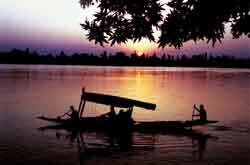 The village Jhiri is located about 20 kms from Jammu, off the Jammu-Akhnoor highway. Every year during the Karthik Purnima (Late autumn full moon) falling during the last week of October and early November an annual mela is held here. Lacs of devotees throng the village to commemorate the martyrdom of Baba Jittoo, a farmer who gave up his life in protest against the oppressive demands of the zamindar about 500 years ago. Legend has it that the zamindar demanded a major share of the wheat crop from Jit Mal a poor farmer. Since the peasant had toiled hard to cultivate the crop he did not want to yield to this unjust demand. Rather than parting with his crop, Jit Mal preferred to take the extreme step of ending his life over the heap of wheat. He has ever since been venerated as Baba Jittoo and is revered for standing up against the injustice and unfair treatment meted out to the peasantry during the feudal times. The festivities during the mela last for a week with the main day of the fair being held on Karthik Purnima. People pay obeisance at the Baba Jittoo temple and seek his blessings and the blessings of his daughter Bua Kouri, who as per the legend also took her life by jumping on her father’s funeral pyre. People also take a customary dip in the Baba-da-Talab (Pond), a natural pond four kms from the temple which is believed to have curative powers. A huge market comes up at the site of the mela and shops and stalls selling selling food items and all sorts of wares are set up. Entertainment and rural sports like dangal (wrestling) also form an important feature of the fair. At a distance 5 km from Jhiri are located ancient temples of Sui & Burj known for their exquisite and elaborate wall paintings and metal idols of Shri Ram & Sita. Pilgrims visit the Sudh Mahadev shrine on Historic Sudhmahadev 3 day Mela (Festival) on the full moon night of 'Sawan' (June -July) to worship the Trident (Trishul) and a mace. 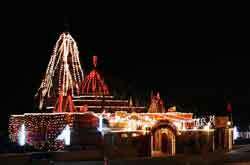 During this 3 day festival, arrangements are made to provide facilities to the visitors. Adequate transport is also provided by the government agencies from various destinations. The government also ensures security arrangements. Cultural programs are organized during the 3 day festival; in which the local performers entertain the visitors by showcasing various local dances and singing folk songs. One can have stay in the temporary tented accommodations provided by J&K Government or even a Sarai maintained by the Dharamarth Trust, beside a few guest houses are also there. The temporary shops are also established by the people to provide various things and eatables to the visitors. Langars are also arranged by some devotees to provide free food to the visitors. Some of the famous food items to eat during the festival are Rajmash Chawal with Desi Ghee, Chatni of Pudina and Anardana. Local food specialties include Klari (a milk preparation like paneer) or Klari kulcha and are very tasty and one must eat there. Those who love sweets have Jlabis and pure Khoya to eat. 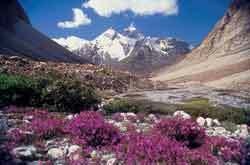 It is a great fair which provides lot of entertainment, natural scenery, joy and spiritual experience. Among the fairs, the Mela Bahu Fort is one of the most popular festivals in Jammu and is celebrated on the auspicious occasion of Ramnavi. The festival is very colourful and the celebration starts with people in large numbers visiting the Temple of Goddess Kali inside Bahu Fort in Jammu to seek Divine blessings. One can see a large gathering in and around the famous Bahu Fort which is a distinct landmark of Jammu. There are all sorts of entertainment and edibles for the kids and all. For enjoyment there are a number of temporary slides and turning boards organised during the festival. For eating, one can have local ice-creams, kulfi, malai-baraf, cane-sugar juice, gole-gapay, aaloo cholay, kachaloo, and jalaibi etc. There are balloons, cotton candy, and of course the entertainers like monkey walla and snake charmers. It is a treat and a good excursion for the kids.